The Blue Jay nest, very much askew after the crash of a neighboring tree. Enough with the suspense. 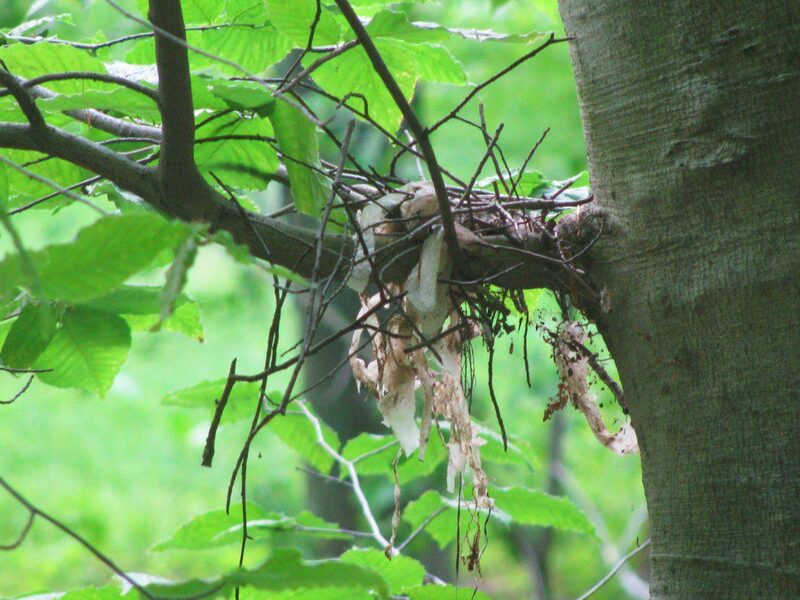 The identity of the bird nest pictured in the May 27th post about a falling tree is none other than that of a Blue Jay. A common bird in backyards and woodlands, the nests of this crow-family member can be difficult to find. A platform of small sticks, placed against the trunk of a tree is fairly typical. What was different about this particular nest was the addition of strips of white plastic. Perhaps the jays liked a little color in their new home, but the falling tree ruined their decorative efforts! Right now is “prime time” to find birds active around their nests. Many birds, like the Baltimore Oriole pictured above, are feeding nestlings right now. Listen for the chatter of nestlings and watch for parent birds carrying beak-fuls of caterpillars and other insects. 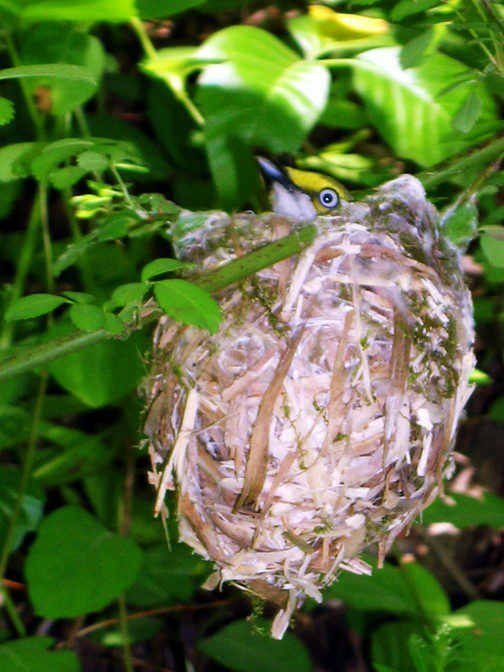 A White-eyed Vireo sits on its intricately woven nest woven onto a multiflora rose stalk. Photo by Derek Stoner. The keen-eyed outdoor observer can find many bird nests by being patient. Watching the coming’s and going’s at the nest is entertaining, and you can witness the incredible construction of nests. 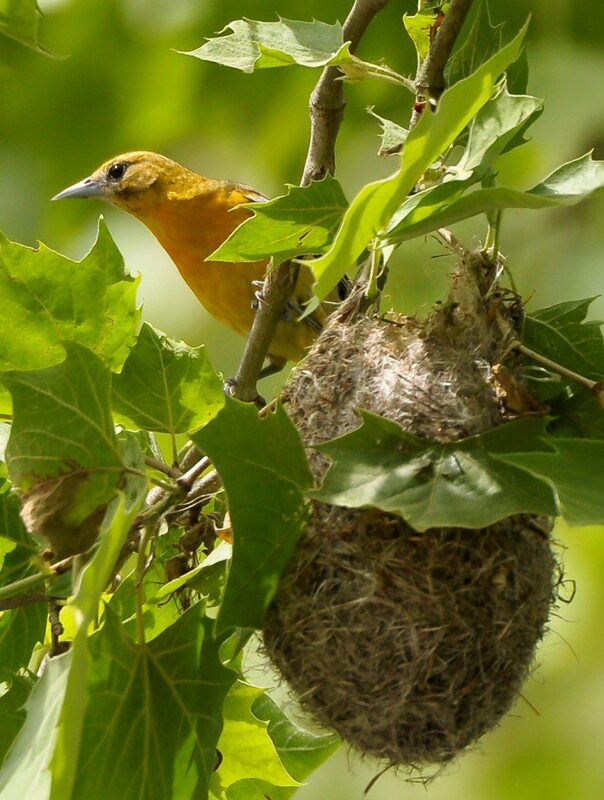 Oriole and vireo nests in particular are made of materials like plant fibers that bend and expand to hold a growing brood of babies inside. True engineering efforts by our feathered friends! Upcoming adult programs through the Delaware Nature Society: Pine Barrens – Orchids and other Wildflowers – June 18; Regal Frittilary Butterfly Trip – early July – TBA depending on Fort Indiantown Gap military training schedule; Susquehanna Gorges Botany – July 2; Pine Barrens Wildflowers – July 18; Yoga at Coverdale Farm and Ashland Nature Center – July dates; Full Moon Walk at Abbott’s Mill Nature Center – July 7. See www.delawarenaturesociety.org for more details. Put the Orange out and within a day we had the Baltimore oriole. the female is about as pretty as the male. ours has a black patch on its breast and no black cap. It also loves the hummingbird feeder.